I have owned nine s30s in the last 10 years since retiring. This 1972 red (110) one is by far the best one I have found. It was first sold in N Hollywood, Ca by Morrie Sage's Universal City Datsun. The 89 year old man from whom I bought the car purchased it in Ca in 1974 for his wife (hence the cloth seats and AC for Phx) and brought to AZ when he was transferred to Luke AFB in 1974. His wife drove it until she got a new Cadillac sometime in the 90's. Odo shows 10800 mi. Last registered in 1990. He was in the process of getting it ready for painting when his wife became ill and died. He shelved the project after priming some door dings and paint chips. This made it look like a pinto pony. I sanded off the primer just to make sure there was no hidden rust. It didn't and has always been rust free. It is amazingly stock throughout. A true time machine, original sheet metal, bumpers, hub caps, FRP headlight buckets, Koito headlights, paint, jute backing, carpet, 240Z rubber floor mats over the carpet, etc. Original engine runs good after replacing leaking fuel pump and lower radiator hose. It has good and even compression in all cylinders. This car can be driven proudly while you replace/upgrade what you want. 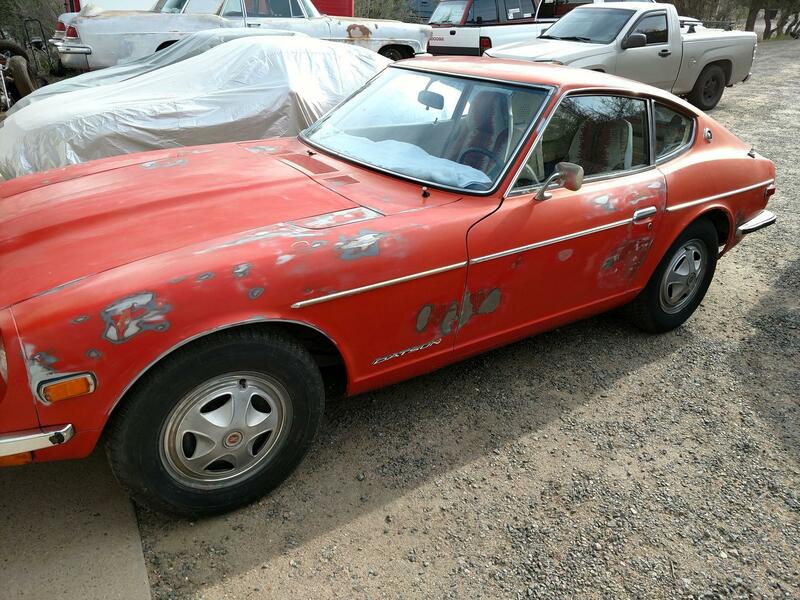 You can brag to your friends that your 240Z doesn't have rusted areas that are going to cost them thousands to fix. Start with a rust free unibody and you will never regret the choice. Most rubber items are hardened like door seals and windshield gaskets but glass is in great shape. Interior is great, dash has four small cracks but very smooth. Factory 4 row radiator. Factory radio and all gauges work except the clock. New Michelin tires, well ok, they were new in 1990, they still look new! Clean AZ title. I'm not keeping it, on to other projects, have to get moving, getting old. If you don't like it being an automatic I have a Z four speed and flywheel I will include. I have a ton of Z parts, little to big, that I want to pass on with the car if you are a restorer.